Dark Heart Designs: After Black Friday Sale! Dark Heart Designs has started an After Black Friday Sale today about an hour ago! Here is the information below! 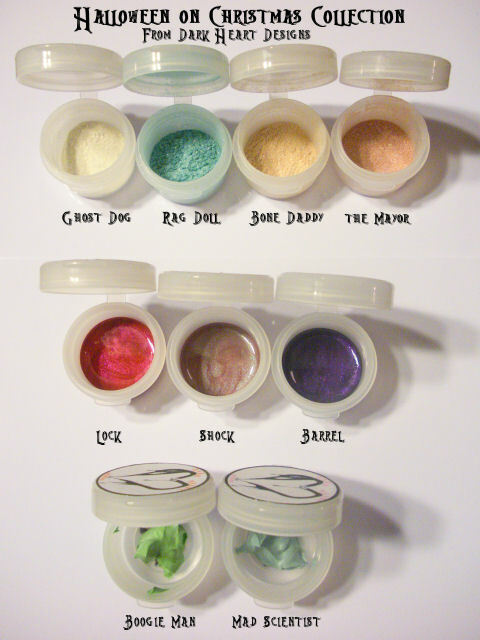 They currently sell Eye Lights (gel liner in unusual colors), Lip Slicks *Lip glosses in both crazy and work friendly shades*, and two types of eyeshadows *duochrome= two colors colliding on your lids ( this includes the Halloween on Christmas Eyeshadows and the beloved Good Witch/Bad Witch collection has returned again! As well as normal shadows that are shimmery in many different shades! They also offer sample baggie colors for if you are indecisive like me! The After Black Friday sale starts now! *Please not that not all jar styles are exactly alike. I’ve had to order a few for this sale that hold the same amount, but are not as tall. The code is BlkFri! Dark Heart Designs Halloween on Christmas Collection Unveiled! Hey everyone! Dark Heart Designs just released their new collection “Halloween on Christmas!” Based off of the Tim Burton Film Nightmare Before Christmas! This collection is dynamic as they are all duochrome and are highly pigmented! They have 4 new eyeshadow shades which are safe for eyes, lips, face and nails/ 3 new lip slick glosses which as you can see in the picture have sparkles in them as well/ and 2 new Eyelight gel liners all inspired by the characters in the movie! I can’t wait to create more looks and show you guys the diversity of this new collection. I think it is very diverse and that it is very marketable to different skintypes because of the soft colors and shimmers. Rag Doll Shadow: A light aqua color with a red undertones and sparkle. Inspired by Sally’s skin tone, and hair color. Bone Daddy shadow: A pale cream/bone color with orange undertones and sparkle. Inspired by Jack, and created with his nicknames in mind: Bone Daddy, and Pumpkin King. Ghost Dog Shadow: A white shadow with red and orange undertones and sparkle. Inspired by Zero, Jack’s ghostly dog companion. The Mayor Shadow: A Beige color with purple and blue undertones and sparkle. Inspired by the mayor of Halloweentown, and his changing faces. Lock Lip Slick: A red semi-sheer gloss shade with purple undertones. Inspired by Lock’s skin tone and red costume. Shock Lip Slick: A mauve semi-sheer gloss with green undertones. Inspired by Shock’s costume and skin tone. Barrel Lip Slick: A dark purple semi-sheer gloss with blue and green undertones. Inspired by Barrel’s sometimes black, sometime purple costume and green shaded skin tone. Boogie Man Eye Light: A bright lime gel eye liner with a slight purple undertone. Inspired by Oogie Boogie, and his sometimes green tone. Mad Scientist Eye Light: A pale gray green gel eye liner with a slight blue undertone inspired by Dr. Finkelstein’s skin tone. I am planning on doing some more looks with this fun collection! On a side note, I recently got into Vlogging on youtube so I plan on trying some new things, I got a request on a makeup 101, choosing colors for skintone etc and I think it’s a great idea so I’m happily procrastinating on that! My youtube is Amystika17 so if you are interested in that look me up! Let me know if any looks in particular you would like to see a tutorial on! Hi everyone! I wasn’t feeling well today but I was really excited to make a look with Dark Heart Designs new collection that has been revealed! Nightmare Before Christmas! My favorite childhood movie ever! This picture unfortunately does not show all of the shimmeryness that these highly pigmented and well made eyeshadows exude. I used three of the new colors for this natural look. I used The Mayor, a neutral beige w/ purplish blue undertones on my lid. 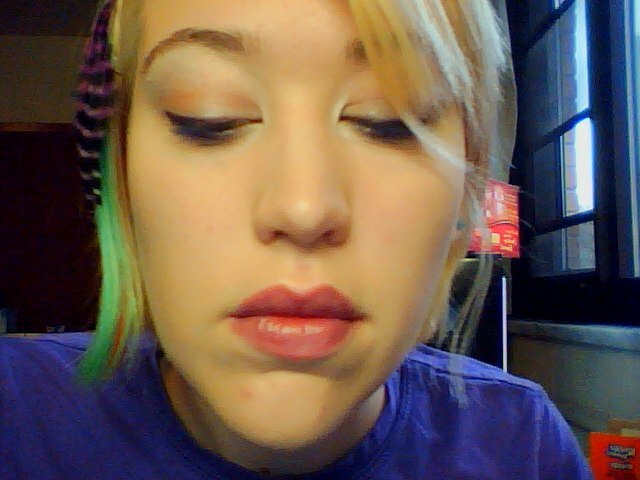 On my inner corners and browbone highlight I used Ghost Dog (based on Zero) a white with orange and red undertones. I also used my sample of Mon Ennui’s Fairytale a pink with gold reflects on my crease. 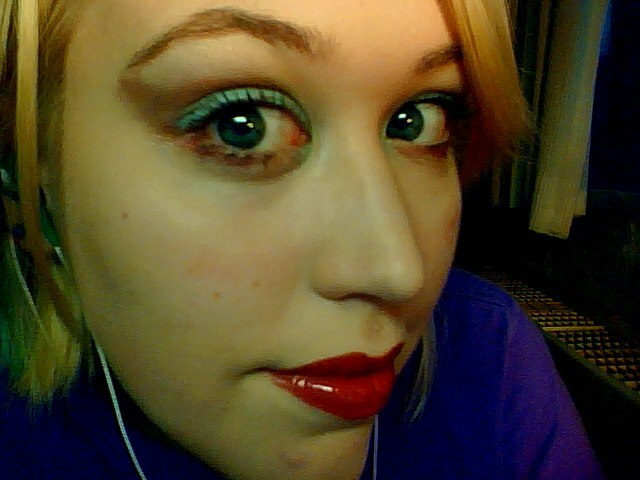 My lips have Shock, a mauve with green sparkles. I have plum eyeliner and purple mascara on as well. I was really impressed with both companies high color payoff using very very little of the product. I consider this a very important quality because you could have a ton of eyeshadow but if you have to put a ton of it on just to get it to show up that doesn’t seem worth it to me. The quality of the lip slick is also impressive, it has high shimmer and coverage and typically I shy away from glosses because of that stickyness that occurs, this however, had none of that and was very lightweight. The shimmer and lightness of this look really helped me not look so sick and crummy and made my eyes really open up! And I didn’t feel like I had a pound of makeup on, always a good sign of good quality makeup. Let me know on any look if you would like a tutorial!